THE MONTGOMERY + ALDRIDGE BUILDING is a 24,468 rentable-square-foot adaptive reuse historic building located in Durham’s Central Park District. Roney Street first began as a residential street, but as the warehouse district began to develop in the 1930s, housing was demolished to construct warehouse and light industrial uses. 320 Roney Street was part of this transformation, built between 1925 and 1937. 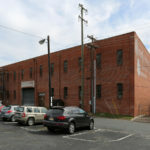 In 1937, it was used by the WP Henry Company as a tobacco warehouse. By the 1950s, Montgomery Aldridge used the property as a tire warehouse. Today, Roney Street is surrounded by vibrant Downtown Durham, with restaurants, retail, entertainment and housing nearby.